The weather was about what you'd expect for South Carolina in May, mechanical failures stacked up dead cars like cordwood, and the Penalty Box had plenty of clients. But some cars neither blew up nor spun out. The S.O.B. Volkswagen GTI dominated for most of the day, opening up a good half-dozen-lap lead on its nearest competitor... but then a spun rod bearing put the team into Engine Swap Mode; they'll be back Sunday, but the overall win now remains firmly out of the Volkswagen's reach. Meanwhile, the veteran E30 pilots of Super Trooper Racing finished the day with a fairly comfortable 5-lap edge. Can they hold the lead all day tomorrow, or will a black flag or two knock them into the mud? In second place, we have the miraculously blown-head-gasket-free Magnum PU Honda. They need to keep the engine together, continue to drive clean, and hope for a stumble by the Troopers; after that, who knows what could happen? Here's the real stop-the-presses shocker of the Top Five: the Jacky Ickx GT30 Mitsubishi 3000GT finished the day in third place, 12 laps behind the leader. "But the 3000GT is a great car," you protest, "No surprise here!" Ah, but real-world LeMons experience differs from on-paper performance to an astonishing degree; not only have Mitsubishis fared incredibly badly, but this particular Mitsubishi has a prior LeMons track record comprised entirely of failure, frustration, and thrown rods. Also, it's a front-wheel-drive version. Speaking of front-wheel-drive, you'd think that the pair of Audis would have profited from the lengthy rainy spells during the day, at the expense of spinout-happy RX-7s. Not so! The Tow Mater RX-7 (formerly the LeMons South Fall '09-winning White Lightning) lurks 15 back of the leader, waiting for its chance to strike. 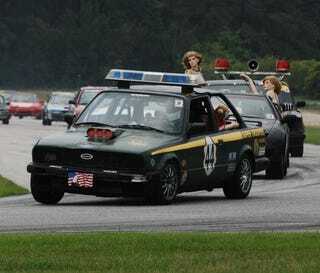 A Crown Victoria Police Interceptor in the Top 5 isn't so surprising, since the Crown Vic's heavy-duty brakes are a real advantage at brake-frying Carolina Motorsports Park. The Rush Hour Racing - Mellow Kab team needs to make up 18 laps to catch the leader. On Sunday, be sure to check out the live video coverage of the race, courtesy of TrackGeeks. Murilee Martin gets crazy baksheesh for his work on the LeMons Supreme Court.